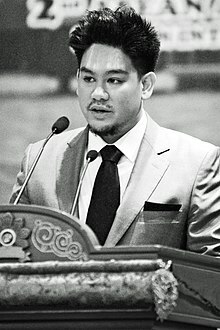 HH Prince Jefri Kiko Bolkiah, Jr.
Haji 'Abdul 'Azim of Brunei (Malay: Yang Teramat Mulia Paduka Seri Duli Pengiran Muda Haji 'Abdul 'Azim; born 29 July 1982), internationally and professionally known as Prince Azim, is the second born prince of Sultan Hassanal Bolkiah. He is the fourth in line to succeed the throne of Brunei. The most well known of the Bruneian royal family, he is a paparazzi favourite. Azim was born in Bandar Seri Begawan, Brunei, 29 July 1982. He is the eldest child of the Sultan of Brunei, Sultan Hassanal Bolkiah, and Pengiran Isteri Hajah Mariam. He is one son of twelve siblings. He was educated at International School Brunei, Raffles Institution (Singapore) and Oxford Brookes University (Oxford, United Kingdom). Upon graduation in 2008, he announced his intent to found an international program to further the study of the Islamic civilisation. In 2008, he was sent to attend the nine-month officer training course at the Royal Military Academy Sandhurst. He left after one week, the shortest stint of any member of the world's royal families. Prince Azim was the guest of honour at the "Seeing is Believing" fundraiser to raise awareness on caring for the blind, held in Brunei on 6 November 2009. In 2009, he designed unisex weekend bags for MCM. The proceeds went to the Make A Wish Foundation UK, a charity in which he is one of the patrons. In May 2011, at a charity show in Brunei Darussalam, held at the Empire Hotel and Country Club's Indera Samudra Hall at which 31 persons with autism performed, Prince Azim said that those with autism should be treated with respect, "as would to any of your family members". On 27 April 2013 at the opening of the 2nd ASEAN Autism Network (AAN) Congress, he urged that appropriate support be given to families with autistic family members, saying: "We want to make our communities more IWA (Individuals With Autism) friendly, whether in terms of spreading a better understanding of the needs of these special individuals or in looking at ways in which we can integrate them better into society and give them brighter futures". The aim of the congress was to provide a platform for networking, as well as to form support groups, for families within the ASEAN region who have autistic family members. On 8 March 2012, Prince Azim attended a seminar to mark International Women's Day in Brunei Darussalam. The seminar aimed to raise awareness on domestic violence, child abuse and other issues affecting women in the nation. He attended Brunei's International Women's Day celebration again in 2013, with a seminar focusing on empowering women. Prince Azim in Kampong Ayer, April 2014. Prince Azim is known for throwing lavish parties with guest lists that have included Michael Jackson, Diana Ross and Scarlett Johansson. His birthday party in 2009 was dubbed the "Party of the Year". The guest list included Janet Jackson, Mariah Carey, Sophia Loren, Joan Collins and Faye Dunaway. His 25th birthday party in 2007 took place in a castle outside London. Breaking Bad star Aaron Paul was a guest of a guest in attendance that year and he told of chasing a large herd of sheep with Prince Azim and princesses Azemah and Fadzilah, riding a hovercraft around the castle and subsequently breaking it, and later having a conversation with Michael Jackson that ended in the two of them doing shots. In April 2019, in light of homosexuality being made a crime punishable by death in Brunei, gay blogger Perez Hilton alleged that Prince Azim is also gay. Recipient of the Royal Family Order of the Crown of Brunei (DKMB). Sultan of Brunei Golden Jubilee Medal (5 October 2017). ^ Streib, Lauren (27 May 2008). "In Pictures: The 20 Hottest Young Royals". Forbes magazine. ^ "Prince 'Azim graduates from Oxford Brookes varsity". The Brunei Times. 6 September 2011. ^ Pendleton, Devon; Serafin, Tatiana. "In Pictures: World's Richest Royals". Forbes. ^ "Winter Ball - London 24/11/2012". Make-A-Wish United Kingdom. Retrieved 3 January 2013. ^ Thien, Rachel (21 July 2011). "Treat autistic with respect, says HRH". The Brunei Times. ^ Othman, Azlan (28 April 2013). "Royal Call For Autism Friendly Community". Sultanate News. ^ Hj. Roslan, Nurhamiza (28 April 2013). "Second AAN Congress Aims To Exchange Knowledge". The Brunei Times. ^ Hj. Kamit, Rabiatul (9 March 2012). "Forum Tackles Violence Against Women". The Brunei Times. ^ Hj. Kamit, Rabiatul (27 March 2013). "JAPEM Seminar To Empower Women". The Brunei Times. ^ Band, Jennifer Sky (26 May 2009). "sweet story from someone who met Michael" Archived 10 January 2014 at the Wayback Machine. The Official Michael Jackson Site. ^ Kay, Richard (28 September 2004). "Has gadget king got a screw loose?". Daily Mail. London. ^ Hinson, Tamara (21 June 2011). "The good prince guide". MSN Her. ^ Alderson, Andrew (20 June 2009). "Prince Azim of Brunei throws party of the year". The Daily Telegraph. London. ^ "Aaron Paul: Beyond Breaking Bad: Cover Stars : Page 2". Details. 1 February 2014. Retrieved 5 August 2014. This page was last edited on 11 April 2019, at 18:49 (UTC).